NEED SOME DETAILS ABOUT THESE !!! CAN ANY ONE HELP ME OUT !!! For me, singing sad songs often has a way of healing a situation. It gets the hurt out in the open into the light, out of the darkness. Asha Bhosle to jam with Robbie Williams! Superstar of international pop music, Robbie Williams will do a duet song with the timeless Asha Bhosle in a special edition of his music album. The twosome will do a remix of Williamï¿½s biggest hits Rock DJ and Better Man. The two songs have undergone a complete makeover, with the sounds of traditional Indian instruments like tablas, sitars and the sarangi. While the revamped Rock DJ sounds like a Bollywood club mix, Better Man sounds more spiritual and soothing. Reportedly, Asha Bhosle recorded her parts in India with instrumentalists and arrangers from China, India, Singapore and Hong Kong. Her vocal parts were recorded in Mumbai, while Morton Wilson from Schtung Studios and his team of arrangers worked on the tracks and the overall production in Hong Kong. These remixes will be available for mobile downloads. The tracks will also be available on Inner Sanctum, the Robbie Williams website. If sources are to be believed, the songs will also be included in a Bollywood film! With two legends coming together in sync, these remix numbers are sure to make waves. After much ado, the Asha Bhosle and Robbie Williams collaboration is finally set for release, soon. In early 2007, Williams had approached Bhosle for collaboration on remixes of two of his tracks, Rock DJ and Better man. Though the news of the duo coming together had been released in limited circles, nothing much was heard of the tracks since. Though Bhosle isnâ€™t sure if the songs will be released as singles or in an album, it is possible that the songs will be part of Williamâ€™s soon-to-be-released eighth solo album, Reality Killed The Video Star. Her newest collaboration is a welcome addition to Bhosleâ€™s long list of international collaborations. The singer, who will turn 76 next week, first famously collaborated with chart-topper British singer-songwriter, Boy George, on his single Bow down mister, in 1991. Since then, she has collaborated with British boy band Code Red on We can make it, American rock singer Michael Stipes on The way you dream and American String Quartet, Kronos Quartret on the album, Youâ€™ve Stolen My Heart, for which she was nominated for the Grammy Awards 2006. In fact, Bhosleâ€™s music inspired the band, Cornershop, to release a song as a tribute to her, titled A brimful of Asha. 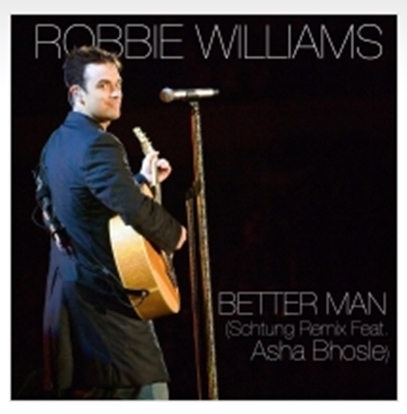 BETTER MAN - Asha N Robbie " 2nd tracks dhall sahab can u help me out ...! No Of Non - Film Hindi Albums By Asha Bhosle !!! can any one post !! ..
from janam samjha karo ...! 37. Asha and Friends (where she sang with Brett Lee, Sanjay Dutt and Urmila Matondkar). She has sung with Code Red.. but can't add that under this list.